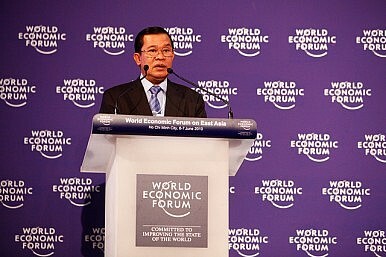 Cambodia's Prime Minister Hun Sen at the World Economic Forum in 2010. A new law fails to address old concerns. Cambodia’s National Assembly has adopted a Law on Trade Unions but labor groups, human rights advocates, and opposition politicians warn that it could be used to stifle the workers’ movement in the country. Despite the delay in its passage caused by protests, the bill was unanimously approved by the members of the ruling party without amendment. The draft law was discussed last year but it was widely criticized by various groups for containing provisions that undermine civil liberties. The law was proposed at a time when workers have been staging sustained protests in factories and in the streets demanding wage increases and improvements in their working conditions. Factory strikes, fainting garment workers, and the political activities of labor groups have attracted widespread international attention, forcing the government to make a commitment to improving the welfare of the country’s workers. Multinational garment companies also pressured the government to ensure that workers are receiving the right amount of wages and benefits. So when the government finally announced its plan to pass a new law on trade unions in response to all this, some saw it was a plot to weaken the labor movement. The suspicion was validated when the text of the document was released. Labor and rights groups immediately condemned the measure as a tool of state repression rather than a genuine attempt to address a longstanding problem. These voices pointed out that even if protests succeeded in raising public awareness about the proposed law, it was still passed without adequately addressing their concerns. What are some of the contentious issues related to the law? First, the scope of the law excludes informal workers, civil servants, teachers, and domestic workers. A separate law is required to provide legal protection for these workers, raising questions about the motivations for this lack of inclusiveness. Second, registration requirements for union formation are overly strict and do not conform to international standards. A rather high minimum threshold of 20 percent of workers on a factory floor is set for union formation even if that level is only 10 people in many countries. Third, the inclusion of age, residency and literacy requirements for prospective union leaders can be read as restrictions on the right of workers. Fourth, labor groups have decried the financial reporting requirement as being overly burdensome. Fifth and lastly, there are also predictably provisions that would make strike action difficult, if not altogether impossible. All these issues combine to undermine workers’ right to free association in Cambodia. The concerns about Cambodia’s new law are shared not only by labor and rights groups, but international organizations more generally. This is evidenced by efforts by specific institutions to convince Phnom Penh to address lingering concerns. For instance, the Office of the United Nations High Commissioner for Human Rights in Cambodia has released a detailed study of the law providing specific recommendations to the government. “These are mainly related to insufficient protection of the right of all workers and employers to freely set up organizations of their own choosing, and of the right of these organizations to decide on their internal matters without interference,” the institution said in a statement. It called for “effective tripartite consultations and advisory mechanisms” to remedy the inadequacies of the law. Domestically, the issue has been viewed as part of a broader attempt by Cambodia’s government to restrict rights and freedoms. One opposition lawmaker accused the ruling party of passing a law “to bring trade unions under control.” Unsurprisingly, the ruling Cambodian People’s Party (CPP) under Prime Minister Hun Sen has denied this. A government spokesperson defended the law by stating that is a balanced approach to promote both the concerns of employees and employers. He added that the law is suitable to Cambodian standards, which sidesteps the real issue of the government’s failure to adhere to international standards. In this context, Cambodia’s trade union law is but one of several new measures that are being criticized by human rights groups. Other controversial laws include the Telecoms Law, which some believe will allow the government to violate the privacy of citizens, and the law on NGOs which has been roundly rejected by civil society groups for being draconian. The Cambodian government asserts that these laws will make the bureaucracy more responsive and efficient. But as the debate on the trade union law demonstrates, the CPP will need to do much more to convince its constituents as well as the international community that it is genuinely committed to promoting democratic reform in society, as opposed to stifling rights and freedoms while consolidating its own power.